The Information Technology section consists of both a Systems Specialist and a Services Specialist. While both postions offer technical support within the whole agency, including maintaining the website and submitting technology related budget requests to the County, each position has its own set of special duties as assigned. Both of these positions also act as Project Manager for new agency technologies as they are introduced. The Systems Specialist's main support is directed toward the Detention Center and the various systems, software and hardware within including acting as Administrator to the Keystone Public Safety software, Dynamic Imaging mugshot system, Livescan Fingerprinting system, jail commissary, and many more. The Services Specialist focuses mainly on the Sheriff Services side setting up new and maintaining the mobile computers and other hardware and acting as Administrator to various programs used by the deputies such as CapWIN, Etix, and the PSSI records management system. Keeping track of financial operations is a job that requires accuracy and attention to detail. The Sheriff's Office employs two Fiscal Analysts with one being assigned to Sheriff Services and the other to the Detention Center. Their job is to handle revenues, budget, inmate accounts/banking, inmate commissary, grants management, and civil processing. The Human Resources Section is responsible for the recruitment, testing, investigative background processes and hiring for the Carroll County Sheriff’s Office. This section performs with a high degree of independence and customer service while maintaining a high level of confidentiality. This intensive process ensures that candidates meet the rigorous standards set forth by the Carroll County Sheriff’s Office. It also ensures that all Law Enforcement and Correctional Deputy Sheriff applicants meet the standards mandated by the Maryland Police & Correctional Training Commissions. Human Resources personnel manage and coordinate the functions of recruitment, application processing, testing and scheduling of interviews and the new hire components which include a physical/medical examination and psychological evaluation. They also maintain personnel and medical files, maintain statistical data to monitor employment, separations and EEO data and track salary adjustments. They serve as liaisons with other Governmental partners. The Human Resources section also employs investigators who perform comprehensive pre-employment background investigations which verify the applicant’s credentials and integrity. In addition, an investigator performs pre-employment polygraph examinations accordingly which has proven to enhance the screening of applicants. The Special Projects Coordinator provides administrative support to the Command Staff for coordinating schedules, meetings, travel and training arrangements, preparing correspondence, interacting with police executives, government officials and the public. This position also serves as Project Manager for many community and agency events. The role of Public Information Officer is an adjunct assignment tasked with providing time sensitive community safety information. The Public Information Officer coordinates press releases, interviews with news media, and maintains the Carroll County Sheriff’s Office social media pages. 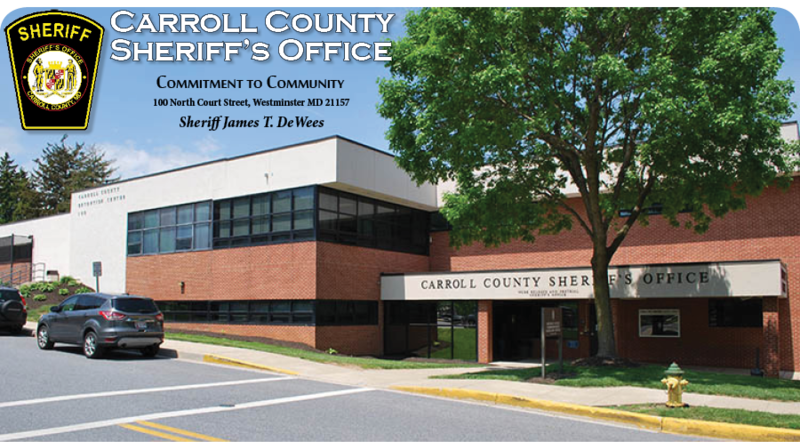 The Carroll County Sheriff’s Office is a full service law enforcement organization that is dedicated to serving the community with the highest level of professionalism. To ensure that we continue to meet the highest standards in law enforcement, Policy Research and Planning reviews and updates policies to ensure consistency with the latest law updates and court rulings. The analysis unit assists the Sheriff’s Office by compiling, calculating, validating, reviewing, and interpreting crime data, traffic data, and other data as needed. In addition to providing statistical information and analysis on the data, the unit reviews all police reports every day with the goal of extracting data and identifying patterns as they emerge. Analyses of these trends, patterns, and hot spots provides the necessary personnel with the “who, what, when, where, how, and why” of emerging crime in the community. The goal of identifying these trends, patterns, and hot spots is to develop effective tactics and strategies to aid in preventing victimization and reducing crime.